Jan Tissing can’t stand it when he sees people in poor postures. As a physiotherapist and ergonomic consultant to companies around the world, he frequently sees work postures compensating for ineffective chairs. Many people face neck strain in the workplace, resulting in significant distraction and discomfort throughout the day. For jobs that require deep attention and heavy screen time, the importance of having proper support cannot be overstated. 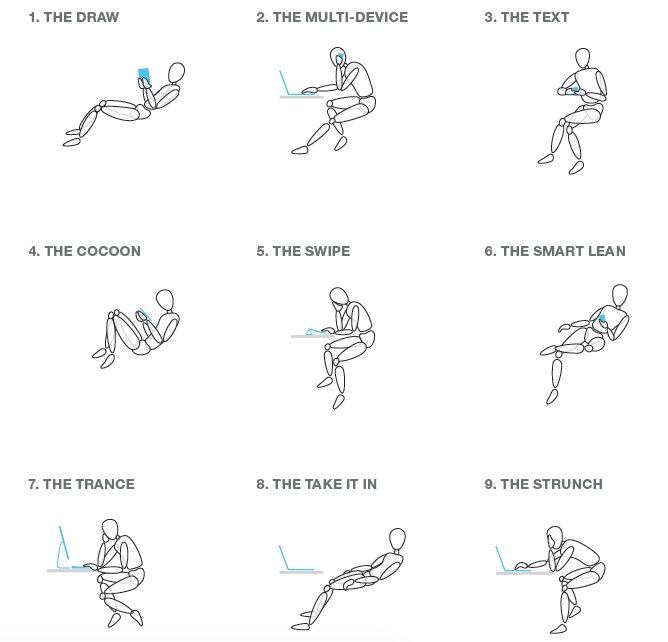 Steelcase identified nine new postures not supported by traditional office chairs. Steelcase has attempted to create a solution to these problems. Building upon its expertise in the study of posture and how workers move throughout the day, researchers conducted a study of over 200 images on the movement of the head and neck, paying special attention to postures that were discovered in response to today’s technology. The Global Posture Study observed people in their working environment, synthesized patterns of behaviour, and developed design solutions for the identified problems. What Steelcase discovered is that much of today’s seating was designed to support the very traditional one-task, one-technology, one-posture experience. However, today’s technologies demand new ways of moving and working. Steelcase identified nine new postures that are not adequately addressed by our current seating solutions. Because these new postures are not adequately supported, workers are uncomfortable, in pain, and doing long-term harm to their bodies. Technology helps productivity, but pain disrupts our work. Hunching and slumping leads to disc compression, excess pressure on the neck and strain on the back and shoulders. Unsupported arms leads to unnatural twisting of the wrists, hands, elbows and shoulders and causes excess pressure on the shoulders. Decrease blood flow in the legs by sitting in positions for long durations can cause misalignment of the spine. The list goes on. 1. Our body is a system in which the back and legs are synchronized in movement. Like the human body, Gesture’s back and seat move as a synchronized system that creates a tailored fit, moving with each user to provide continuous lumbar support. 2. Gesture’s arm moves like the human arm, which helps people to get closer to their work and supports their arms and shoulders, no matter the device they are using. Gesture’s arms are mounted behind the hip to support a wider range of postures and people. 3. The contoured seat distributes weight to make it comfortable longer. It is flexible at the perimeter to allow a range of postures without pinching or cutting off circulation. The seat depth control is responsive, and makes it easy to “fine tune” so people are less likely to perch on the edge of their chairs. Steelcase asked Tissing to evaluate the Gesture chair and consider how well it performs for today’s multitasking, tech-wielding workers. Tissing and his team evaluated the chair using 22 test subjects between the ages of 23 and 61. Each person used Gesture from three to 10 hours during a typical workday. Users were not told how to adjust Gesture or even how to sit with proper posture, only that they would be photographed while working. A high-definition video camera captured each user’s position every 30 seconds, documenting how they worked, moved and interacted with colleagues as well as with the Gesture chair itself. Another issue he saw with the test workers’ chairs: back tension adjustments were difficult to find and use. Some users lacked the weight or heft to recline the seat back, or didn’t know how to adjust back tension, so the back remained in the upright position. That meant users could not recline and reduce the pressure on the sitting bones and more evenly distribute that pressure throughout the upper body. Headrests were lacking on most of the users’ chairs too. and sizes. It is especially supportive in applications with external monitors and supports users by allowing them to recline and work while keeping the head and neck centered over the spine. “Few standard task chairs have a headrest. It’s typically added as an upgrade to create a manager chair,” says Tissing, who believes headrests should be more widely available. In fact, when Tissing gave users brief instructions in chair use and posture, or showed them time-lapse images of themselves at work, they assumed more reclined postures and took advantage of the Gesture chair back and headrest, more so than when using other chairs. Tissing found that Gesture’s seat comfort, depth, the smoothness of the mechanism and the backrest combine to provide good comfort and support. Even when reclined in the Gesture chair, users found no need to reposition themselves after long periods. Advanced, automatic lumbar support, combined with Gesture’s capability to adapt to weight differences between users and its armrests, give the standard Gesture an advantage over many other chairs. Tissing also found that the highly adjustable neck rest made a difference to the user.